Virtual hairstyles app to try hundreds of hairstyles and hair colors on a photo of yourself. Do countless makeovers on a photo of yourself and see exactly what you will look like before getting your hair cut or styled! - online app = no downloads and nothing to install. 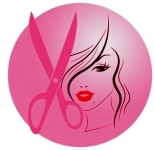 - over 200 haircuts and hair colors to try on. - save hairstyles to your own device. Ready to try on over 11,000 hairstyles, 50 hair colors, highlights and make-up? Signup for free and use the Advanced Hairstyler!